Have a little drinking problem in Romania do they? Officials in Pecica, a village town about 13 miles from the Hungarian border in the country’s west, ordered the bright red signs, complete with the phrase “Attention – Drunks”. 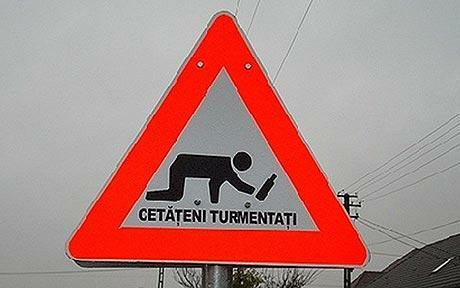 via Romanian street sign warns drivers of ‘drunk pedestrians’ – Telegraph. March 10, 2010 Posted by oldstersview | Dumb Stuff, Strange	| drinking, drunk | Comments Off on Have a little drinking problem in Romania do they? March 1, 2010 Posted by oldstersview | Dumb Stuff	| drunk, naked | Comments Off on Want an air traffic control career? Drunk and naked is not how to start. 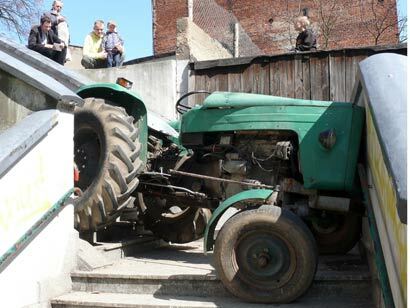 A Polish farmer is facing jail after he drove his two ton tractor down a set of stairs in a drunken bet. Tomasz Jankowski, 45, tried to drive his tractor down the city centre steps in the middle of a town square in Tczew in north west Poland after drinking with friends.